POSITAL has upgraded its facilities for producing Wiegand sensors . These components, which generate small amounts of electrical energy from rotary motion, are used to energize low-power electronic devices such as counter circuits. To date, more than 500,000 Wiegand sensors have been manufactured and sold, 80% of which are used in motor-feedback applications. With its expanded production facilities, POSITAL has the capacity to manufacture a further million devices annually, with material secured for the next 10 million sensors. Since 2014, POSITAL has been the world’s main source for Wiegand wire and related products. The company makes use of Wiegand-powered rotation counter systems in their popular IXARC multi-turn rotary encoders. It also provides Wiegand sensors to other manufacturers for use in energy-harvesting electronic counter systems. They are reliable, durable, and allow these counters to keep a continuous record of shaft rotations without the need for external power sources or high-maintenance battery systems. When used with multi-turn rotational sensors in motor feedback systems, they offer greater tolerance to shock, vibration, dust and moisture than alternative systems based on optical or mechanical measurement techniques. From use in keycards and tokens, to pulse generators and servo motor applications, the performance and quality of this established technology has been continually improved over the last four decades. 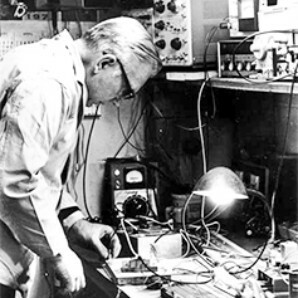 John Wiegand, inventor of Wiegand wire, at work in his lab.